Russia: A World Apart is a haunting evocation of the ruined country estates of the Russian aristocracy of the 18th and 19th centuries. Revolution, civil war, invasion, anarchy and casual indifference have conspired against many of the grand buildings of Russia's rich and complex past. The architectural riches of Moscow and St Petersburg still exist for everyone to see, but when the photographer Simon Marsden and author Duncan McLaren entered the Russian countryside, away from the obvious tourist trails, they encountered a very different world. This book, the result of four trips undertaken by Marsden and McLaren, illustrates a diverse mix of pre-revolutionary buildings and memorials, manor houses, palaces, churches, statuary and tombs, interspersed with more recent monuments from Soviet times. Each picture tells its own tale. In the newly found freedom and optimism of the post-communist era, some of these estates are being restored by individuals and organisations whose immense dedication to rescuing their past is nothing short of inspiring. 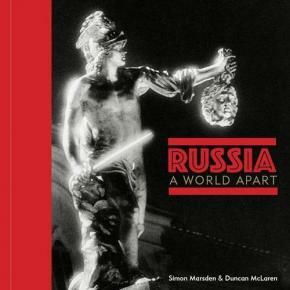 Others will simply crumble to dust in the face of indifference from the majority of the population making Russia: A World Apart a beautiful and melancholy testament to the glories and grandeur of the past few centuries.